The Vikings, Columbus, the Pilgrims "¦ they all arrived here by ship. So it stands to reason that some of the phrases we use today were born on the high seas. While sources differ on the roots of many sayings, others have a clear path to the days of sailing across the ocean. Here's a look at 9 family-friendly phrases that likely came from the mouths of sailors. 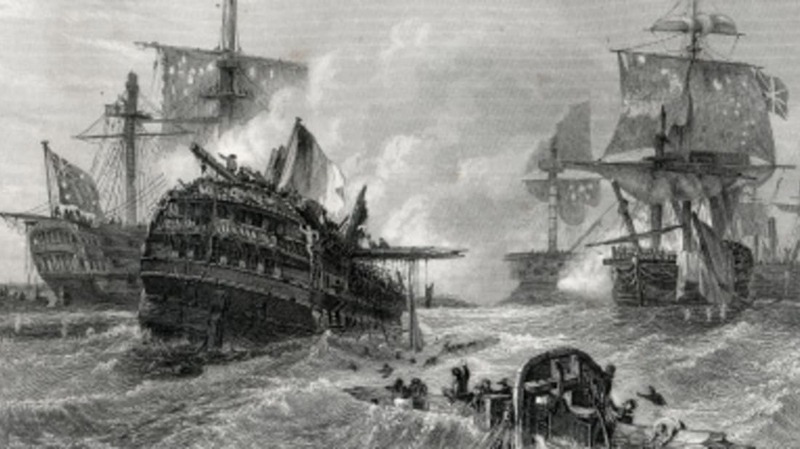 The "Age of Sail" in the 18th and early 19th centuries was a glorious time in naval history marked by many epic battles on the high seas, but it was also a time of widespread disease. In order to receive permission to dock at a foreign port, ships were often required to show a bill of health—a document that stated the medical condition of their previous port of call, as well as that of everyone aboard. A "clean bill of health" certified that the crew and their previous port were free from the plague, cholera and other epidemics. Today, a person with a "clean bill of health" has passed a doctor's physical or other medical examination. During the Age of Sail, "The Doldrums" were stretches of ocean north and south of the equator that were infamous for their light winds. If a vessel was caught there, it could languish for days or even weeks waiting for the wind to pick up, which made for a very bored crew. Eventually, The Doldrums became so well known that the name was applied to any area with light winds. Today, someone who is "in the doldrums" is either listless or depressed. Many people are surprised to learn that this expression for drunkenness was born on the high seas. "Sheet" is the nautical term for the rope that controls the tension on a square sail. If the sheets are loose on a three-masted ship, then the sails will flap uselessly in the wind, and the ship will drift out of control until the situation is corrected. Thus, the modern phrase "three sheets to the wind" has come to signify a person who is intoxicated to the point of being out of control. The roots of the term "filibuster" can be traced to the pirates who prowled the shipping trade routes in the 17th, 18th and 19th centuries. The Dutch word for pirate was vrijbuiter—a word that eventually led to the French term flibustier and the Spanish term filibustero. The British, however, pronounced it filibuster. So how did the word for pirate became associated with obstructionist political tactics? It's still a bit of a mystery, but some historians speculate that, since pirates were an incessant, obstructing nuisance, they effectively blocked trade in many areas, just as politicians try to block legislation today. Most people think this term originated in the smoke-filled boardrooms of corporate America. Surprisingly, however, it can be traced back to some clever ship cooks who saved the slushy mix of fat and grease that was left over after every meal. The slush would be stowed away in a secret hiding place until the ship returned to port. The cooks would then sell the fat to candle makers and other merchants, earning themselves a tidy sum in the process. Thus, the term "slush fund" refers to an illicit cash reserve. A sailing vessel was considered seaworthy if it could sail both "by" (into the wind) and "large" (with the wind). This term has come to mean "generally speaking" in modern parlance. Along with salted beef and water, the British Royal Navy issued sailors a daily ration of rum to keep them happy during long months at sea. And, not surprisingly, the men would often save up several days' worth of their rations before consuming it in one long binge, which frequently resulted in insubordination. In 1740, hoping to reduce the number of alcohol-fueled discipline problems, British Admiral Edward Vernon ordered all vessels to dilute their daily rum ration with water. Vernon was known as "Old Grog" because he always wore a coat made out of grogram, a coarse material that was stiffened with gum. Consequently, the diluted rum drink that he created became known as grog, and sailors who drank too much of it were said to feel "groggy. " Today, people who are overly tired, lightheaded or generally inebriated are still referred to as groggy. Keeping watch onboard sailing ships was a boring and tedious job, but the worst watch station was on the "weather" (windward) side of the bow. The sailor who was assigned to this station was subject to the constant pitching and rolling of the ship. By the end of his watch, he would be soaked from the waves crashing over the bow. A sailor who was assigned to this unpleasant duty was said to be "under the weather. " Sometimes, these men fell ill and died as a result of the assignment, which is why today "under the weather" is used to refer to someone suffering from an illness. A related theory claims that ill sailors were sent below deck (or "under the weather") if they were feeling sick.